Or are they? Russell Wilson still isn’t liking the numbers he’s seeing from the Seattle Seahawks in regards to his next contract, and looks closer and closer to playing in the 2015 NFL Season under the final year of his rookie contract with a lot of uncertainty in the future. Wilson is asking for something along the lines of $25 million a season, making him the highest paid quarterback in the NFL, relying on the fact that there should be a boost of around $10 million in the salary cap from 2015 to 2016. The Seahawks are offering around $21 million a season. The highest paid player in the league, by the way, is Aaron Rodgers, with an average annual salary of $22 million. Going down to exact numbers, the Seahawks are willing to give Wilson something that’s slightly less than what the Steelers are paying Ben Roethlisberger, which is $21.85 million a year on average after his latest extension. It’s all about timing when it comes to signing contracts, and it looks like Wilson is a year ahead of the moment when $25 million a year deals for quarterbacks look a bit more reasonable. 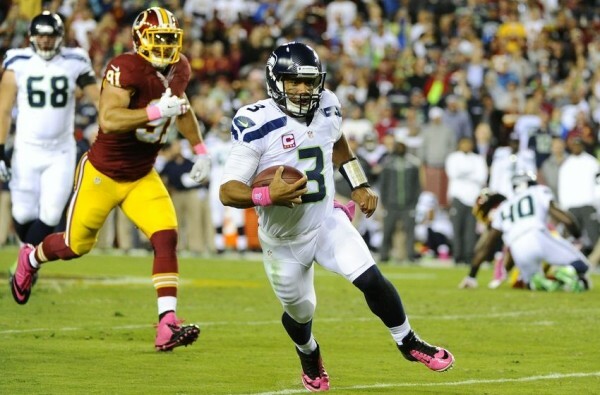 Wilson will be paid $1.52 million for 2015 if he plays under his rookie deal. Obviously, the Seahawks can use the franchise tag on him, which should be worth around $21 million in 2016, although that is yet to be determined, depending on the final cap number. There’s a way out of it for Wilson – through the nonexclusive tag, which means a team will need to give up two first round draft picks to sign Wilson, but won’t the Seahawks match whatever is offered to Wilson? Besides the risk of injury which is always around in the NFL while playing well below his value when there’s a $20 million’ish contract waiting for him on the table, there’s the matter of mathematics, suggesting Wilson won’t be really helping himself out in making more money if he actually makes it into training camp without a new deal. Assuming a team is willing to give Wilson $25 million a year over four seasons in 2016 and he leaves the Seahawks. Add that to the $1.5 million he makes in 2015, and that’s $101.5 million over five seasons, which makes it less on average than what the Seahawks are offering him right now. To match what the Seahawks are offering now, Wilson would need a team to pay him $26 million a season. There’s also the matter of the signing bonus. Roethlisberger made $31 million last season because of it, and Cam Newton made the same amount. The Seahawks probably can’t go to more than $20 million in cash this year because of the salary cap (they have $9.27 million in cap room). But if it’s so important for Wilson to make $25 million this season, it can be worked out. Right now, things don’t seem to be moving in a positive direction.